CINCINNATI — The fatal crash that killed two-year-old Dameon Turner Jr. as his family strolled him along the sidewalk in Camp Washington put a tragic punctuation mark on a year in which more drivers hit Cincinnati pedestrians than any other in recent memory. If recent news headlines weren't enough to show it's a problem that's just getting worse, crash data can: Crashes involving pedestrians have been getting more and more frequent year after year. Crash records show in 2013 the Cincinnati Police Department reported approximately 293 pedestrians involved in a crash. By 2018, that number climbed to roughly 428 individuals. 2017 was the only year since 2013 that saw a slight decline in pedestrian-involved crashes — down two from 2016 — but last year saw another increase. The most dramatic spike came between 2015 and 2016, which saw a 16 percent jump in pedestrian-involved crashes. This trend will come as no surprise to anyone following City Council meetings during December, after nine Cincinnati Public School students were struck on their walks to class. The string of incidents prompted a parents' rally outside two of the district's biggest high schools and a special Law and Public Safety Committee meeting. Crash report data indicate more than 40 pedestrians were involved in crashes that month. The crash report data do not indicate fault for each incident, nor do they provide a narrative of each crash indicating whether distraction, impairment or crossing outside a marked crosswalk were factors in the crashes. The nine students hit in December were just a small fraction of the more than 100 children whom drivers struck in 2018 alone. Among those was 15-year-old Gabriella Rodriguez, who died from injuries she sustained after two drivers struck her as she was crossing Harrison Avenue on an early, pre-dawn September morning. The second driver in that crash, whom police said caused the bulk of Rodriguez's injuries, fled the scene and remains at large. The last pedestrian fatality of 2018 involved the toddler Dameon Turner Jr., whose parents were walking across the Hopple Street Viaduct when police said an impaired driver crossed the center line in a pickup truck and hopped the curb before striking the toddler's stroller. Turner died from his injuries the next day, on Dec. 30. Hamilton County Sheriff's deputies are holding the driver in that case on a $1 million bond as they await a grand jury's recommendation on charges, which is expected next week. The trend mirrors a national rise in pedestrian fatalities over the better part of the last decade: According to a 2018 report by the Governor's Highway Safety Association , pedestrians have made up a steadily increasing percentage of traffic fatalities, rising from 11 percent in 2007 to 16 percent of all traffic deaths in 2016. Ohio ranked below the national average for pedestrian fatalities in 2016, according to that report. A WCPO analysis last year of crash data compiled by Ohio Department of Public Safety found that when non-motorists were involved in a crash, they were far more likely to be injured or die compared with someone in a vehicle. In 2017, non-motorists made up more than 16 percent of traffic fatalities in Cincinnati and more than 6 percent of traffic injuries. But they were less than 2 percent overall of the units involved in crashes. In 2018, that percentage held steady around 16 percent. When it came to serious, "incapacitating" injuries, pedestrians comprised roughly a quarter of those crashes. The string of crashes have members of City Council demanding swift action from the city's Department of Transportation and Engineering as well as the police department. "This isn't some intractable, societal problem where we just kind of shrug and pass it on to the next generation," said Councilman P.G. Sittenfeld in a special Dec. 27 session of Council's Law and Public Safety Committee. "There are things we can do if the will is there that can make sure that kids are not getting hit when they're crossing the street." Vice Mayor Christopher Smitherman, who chairs the committee and called the special session last week, pressed DOTE officials for both short-term and long-term approaches to the problem. "We have long-term things that we're going to be working on, clearly," Smitherman said. "What are those short-term things we can do right now, that are in our power, so that we can clearly send the message that we're in the process of fixing?" The Cincinnati Police Department Traffic Enforcement Unit spent the last months of 2018 working to reallocate resources toward curbing aggressive driving. As WCPO reported last year, traffic enforcement stops by CPD officers had steadily declined by nearly 60 percent between 2009 and 2016. Assistant police Chief Lt. Col. Paul Neudigate attributed that to a public mandate asking police to focus more on violent crime, but said that in 2017 traffic enforcement stops began to climb again. "For a long time, traffic was not something there was a lot of emphasis on. 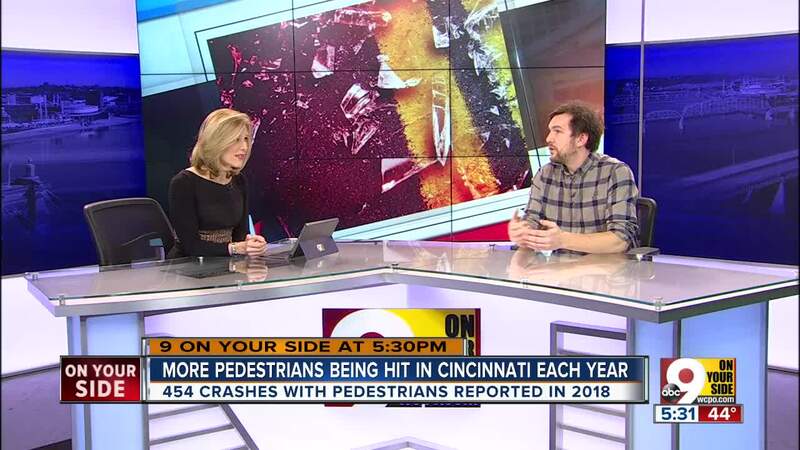 It's there now," Neudigate told WCPO in October, just before a two-week traffic enforcement blitz targeted crash hotspots in more than 20 neighborhoods across the city . "We've heard the community, so what we're trying to do now is be very responsive to the community concerns." Smitherman said he expects to continue discussions about pedestrian safety around CPS high schools at his committee's next meeting on Jan. 7. Pat LaFleur reports on transportation and mobility for WCPO. Connect with him on Twitter ( @pat_laFleur ) and on Facebook.